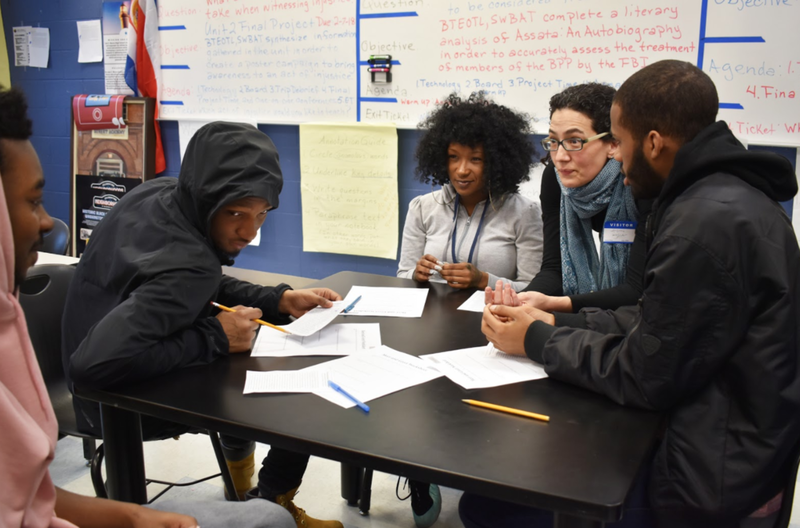 As part of the Black Lives Matter Week of Action, Teaching for Change staff member Alison Kysia visited Luke C. Moore High School to teach Black Muslims in the United States: An Introductory Activity. She began by asking the class if they could name any Black Muslims, and the students called out names including Muhammad Ali, Malcolm X, Khallid Muhammad, and Louis Farrakhan. Kysia then handed each student a short biography of a Black Muslims. After carefully reading their biographies, students participated in a role play activity where they took on that person’s role. Students tried to “meet” other Black Muslims who fit the descriptions on a questionnaire, which included a person who was enslaved, someone discriminated against for their skin color or religion, a woman, an activist, and a Black Muslim who is alive now. After the meet and greet, Kysia asked students to reflect on what they had learned. Students pointed out that they had not learned about Black Muslims who had been enslaved before. They also discussed the connections between hip-hop and principles of Islam through artist and activist Yasiin Bey (formerly known as Mos Def). Kysia’s lesson allows students to examine U.S. history through a new lens that connects the Black experience with the Muslim experience, and plants the seed for further exploration.